The blood brain barrier (BBB) presents a formidable challenge to the delivery of drugs into the brain. Several strategies aim to overcome this obstacle and promote efficient and specific crossing through BBB of therapeutically relevant agents. One of those strategies uses the physiological process of receptor-mediated transcytosis (RMT) to transport cargo through the brain endothelial cells toward brain parenchyma. Recent developments in our understanding of intracellular trafficking and receptor binding as well as in protein engineering and nanotechnology have potentiated the opportunities for treatment of CNS diseases using RMT. In this mini-review, the current understanding of BBB structure is discussed, and recent findings exemplifying critical advances in RMT-mediated brain drug delivery are briefly presented. Brain diseases are among the less understood and poorly treated conditions. 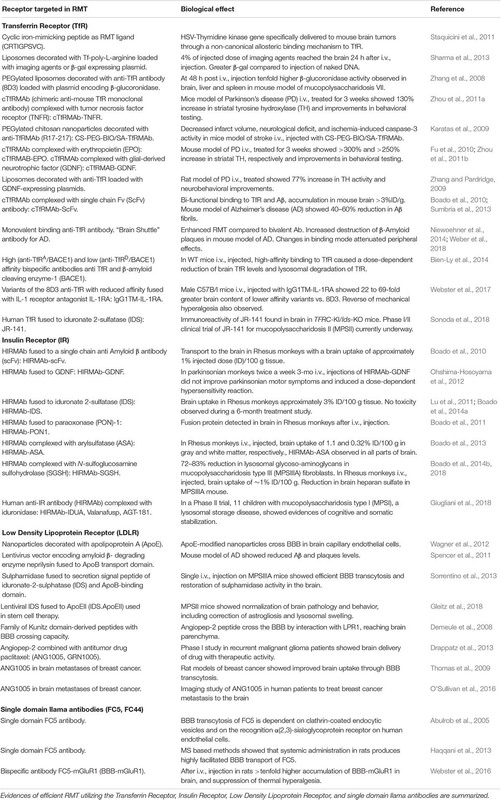 In spite of the rapid growth in recent years in drug development, there is still a low success rate of effective therapies focused in diseases of the central nervous system. A main issue hindering therapeutic success is the tightly regulated extracellular environment of the brain tissue which makes reaching macromolecular targets into the brain a great challenge (Pardridge, 2005; Abbott, 2013; Engelhardt et al., 2016). The isolation of the brain tissue from the peripheral circulation is thought to arise from the existence of multi-level “barriers,” established in different compartments in the central nervous system of most vertebrates (Cserr and Bundgaard, 1984; Engelhardt et al., 2017) providing protection to the neural tissue. Key to those protective mechanisms is the regulation of the entry of macromolecules from the blood to the brain across the blood-brain barrier (BBB) (Abbott et al., 2006). The BBB regulates an extended surface of interaction between blood and brain. It is calculated that the brain capillary network in humans is approximately 600 km long with a surface of 15–25 m2 (Wong et al., 2013). The intimate association between neurons, glial cells, and brain microvessels in the neurovascular unit is being recognized as the functional point for regulation of cerebral blood flow. Among those cell types, the brain endothelial cells are the building blocks of the BBB impeding the entry of most molecules from blood to brain, with the exception of those small and lipophilic in nature. Several recent studies have focused on the functional interactions between endothelial, neuronal and glial cell types and their role on regulating BBB function (Persidsky et al., 2006; Chow and Gu, 2015; Liebner et al., 2018). Since neurons rarely occur at long distance from a brain capillary (Schlageter et al., 1999; Tsai et al., 2009), the BBB also plays a major role in controlling fast delivery of substances to the brain and the local neuronal environment. Due to its extended contact and exchange surface area, most research has focused on the brain endothelium as the therapeutic target to increase brain drug delivery. Structurally, capillary networks can be divided into continuous non-fenestrated capillaries, continuous fenestrated and discontinuous capillaries. This division is based on their ability to regulate crossing of solutes from blood to tissues; thus continuous fenestrated capillaries are least permeable whereas discontinuous are the most permeable (Aird, 2007a,b). In the BBB, continuous non-fenestrated capillaries, where tight junctions (TJs) connect endothelial cells, form a high-resistance para-cellular barrier limiting the crossing of molecules and ions. Transmembrane proteins are an important part of TJs, they bind the cytoskeleton and link adjacent endothelial cells in a close configuration, eliminating intercellular spaces. Some of the proteins important for TJs structure and function include integral membrane proteins such as members of the claudin family i.e., claudin 3, 5, and 12, ocludins, and junctional adhesion molecules (Anderson and Van Itallie, 2009; Furuse, 2010). Evidences indicate that claudins are essential for the formation of the para-cellular barrier and the structure is stabilized by zona occludens ZO -1, -2, and -3 and additional proteins that link the TJs with the cytoskeleton (Abbott et al., 2006; Furuse, 2010). This structure is further reinforced by the basal lamina, a ∼40 nm thick matrix formed predominantly of collagen type 1V, laminin, and heparan sulfate proteoglycan (Perlmutter and Chui, 1990). Metalloproteinases are other components that contribute to regulation of BBB function in health and disease (Yong, 2005). Additionally, glial cells such as astrocytes play an important role in development and maintenance of the BBB. Up to 99% of the basal capillary membrane is covered by astrocytes “end feet” and glial-derived factors such as GDNF, angiopoietin-1 and angiotensin II all contribute to BBB integrity (Hori et al., 2004; Abbott et al., 2006; Wosik et al., 2007). Along with astrocytes “end feet,” pericytes are also lining the cerebral vasculature, surrounding brain endothelial cells and contributing to the barrier properties of the BBB. Recent advances on pericytes research indicate that this cell type is rather complex with more than one functional definition depending on their location along the arterio-venous capillaries (Attwell et al., 2016). The fact that brain microvessels are enriched in pericytes, and pericyte-deficient mouse mutants showed increased BBB permeability (Armulik et al., 2010) exemplifies the importance of pericytes for BBB control. Pericytes seem to contribute in two ways to BBB integrity: downregulating trans-endothelial permeability and promoting astrocyte-endothelial cells contacts (Armulik et al., 2010). Moreover, growing evidences point now to the importance of the interactions between pericytes and other cell types within the neurovascular unit in health and disease (ElAli et al., 2014). The multicellular organization occurring at the neurovascular unit involving endothelial cells and astrocytes among others cell types (Willis, 2012) forms the framework where the highly regulated crossing of macromolecules from blood to brain occurs. The existence of efflux transport systems in brain capillary endothelial cells reinforce the barrier properties of the BBB by removing undesirable substances from the brain to the systemic circulation. Multidrug resistance transporters, monocarboxylate transporters and organic anion transporters/organic anion transporting polypeptide have been implicated in the efflux of drugs from the brain. Consequently, the activity of these efflux transporters limits the effectiveness of CNS targeted drugs (Loscher and Potschka, 2005; Figure 1C). Figure 1. Potential mechanisms for crossing the blood brain barrier (BBB). Polarized endothelial cells, bound by tight junctions, form a seal that controls free movement or molecules from blood to brain. In brain capillaries, endothelial cells are in intimate association with astrocytes. 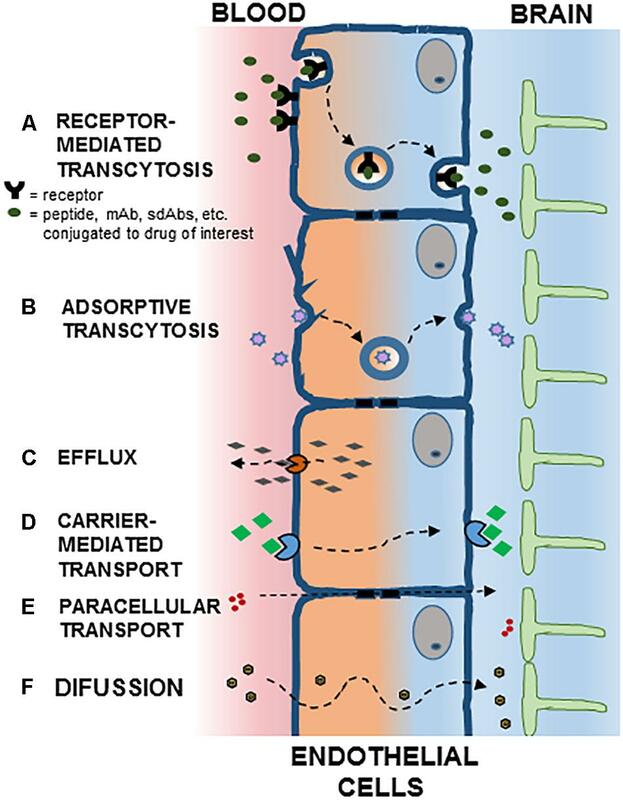 Potential mechanisms for crossing the BBB are indicated: (A) Receptor Mediated Transcytosis; (B) Adsorptive Transcytosis; (C) Efflux; (D) Carrier-Mediated Transport; (E) Paracellular Transport; (F) Diffusion. See text for details. Most of the drug transporters belong to two major classes; adenosine triphosphate binding cassette (ABC) and solute carrier (SLC) transporters. ABC transporters are active transporters coupling efflux against concentration gradients to ATP hydrolysis with P-glycoprotein (P-gp) being the most extensively studied BBB transporter of the ABC family (Mahringer and Fricker, 2016). P-gp is encoded by the multidrug resistance gene 1 (MDR1) and its function is regulated by intracellular factors and environmental toxins (Dauchy et al., 2009). In order to facilitate the efficient delivery of drugs to the brain, the functional and structural tightness of the BBB needs to be overcome. Strategies used to cross BBB involve para-cellular as well as trans-cellular mechanisms. As part of its normal function, the endothelial cells allow the influx of nutrients and regulatory molecules into the brain via passive and active mechanisms. In normal conditions, some passive movement of solutes exists through small intercellular pores located in the TJs (Figure 1E). The molecular entities responsible for this transport are largely unknown, although recent evidences point to claudins as pore-forming structures in BBB TJs (Irudayanathan et al., 2017). Since early stage CNS diseases do not show evident BBB alterations, this pathway offers fewer opportunities than trans-cellular transport for drug delivery. Transport of small molecules trough cells is common in polarized cells. Thus, in brain vascular endothelial cells, hydrophobic molecules with molecular weight lower than 500 Da once they escape the P-gp-type multidrug resistance efflux pumps may diffuse transcellularly from systemic circulation to brain parenchyma (Figure 1F). The transport of nutrients, however, requires specialized transporters (Figure 1D). Thus, large neutral aminoacid transporters (LAT1) transport aminoacids, nucleosides, and some drugs, while glucose uses the glucose transporter (GLUT1) (Ohtsuki and Terasaki, 2007; Barar et al., 2016). Transcytosis is a phenomenon present in many different cell types, from neurons to intestinal cells, osteoclasts and endothelial cells. In polarized cells, unidirectional transcytosis refers to the transport of macromolecules from apical to basolateral plasma membranes. Steps along this pathway include endocytosis, intracellular vesicular trafficking and exocytosis. The first of these steps may involve adsorptive (charge dependent) or receptor-mediated internalization (Figures 1A,B). Positively charged molecules such as polymers, cationic lipids, albumin and nanoparticles may interact with the negatively charged cell membrane and internalize through adsorptive endocytosis (Lu, 2012). Although initially thought to be attenuated in brain endothelial cells, virtually all endothelial cells display receptor-mediated transcytosis (RMT) (Stewart, 2000). Recent applications of imaging techniques allowed for detailed analyses of transcytosis in brain endothelial cells (Villasenor and Collin, 2017). Several receptors capable of inducing RMT are present in the BBB, such as the insulin receptor, transferrin receptor, and receptors responsible for lipoprotein transport, while others such as albumin receptors are not expressed (Pardridge et al., 1985). The intracellular transport of macromolecules is mediated by the vesicular system (Parkar et al., 2009). In brain endothelial cells three types of endocytic vesicles have been identified: clathrin-coated pits involved in most of the RMT, caveolae that participate in adsorptive-mediated endocytosis of extracellular molecules and receptor trafficking, and macropinocytotic vesicles (Mayor and Pagano, 2007). Of these, clathrin-coated vesicles are involved in most of the internalization processes mediated by approximately 20 different receptors in brain endothelial cells. Once a vesicle is internalized, the common intracellular pathway begins with the initial sorting station, the early endosome (Rodriguez-Boulan et al., 2005; Brooks, 2009; Figure 2). In BBB endothelial cells endocytosis occurs at the apical and basolateral membranes with both processes generating its own early endosomes. In polarized cells, routing back to the plasma membrane can occur directly from EE or from recycling endosomes (Thompson et al., 2007). Alternatively, vesicle components can be delivered to late endosomes and targeted for lysosomal degradation. This endosomal trafficking plays an important role in the efficiency of RMT in BBB (Haqqani et al., 2018). Figure 2. Receptor mediated transcytosis in the BBB. A ligand binds its cognate receptor at the apical membrane of the brain endothelial cell (1), and initiates the invagination of the plasma membrane and the endocytosis process (2). 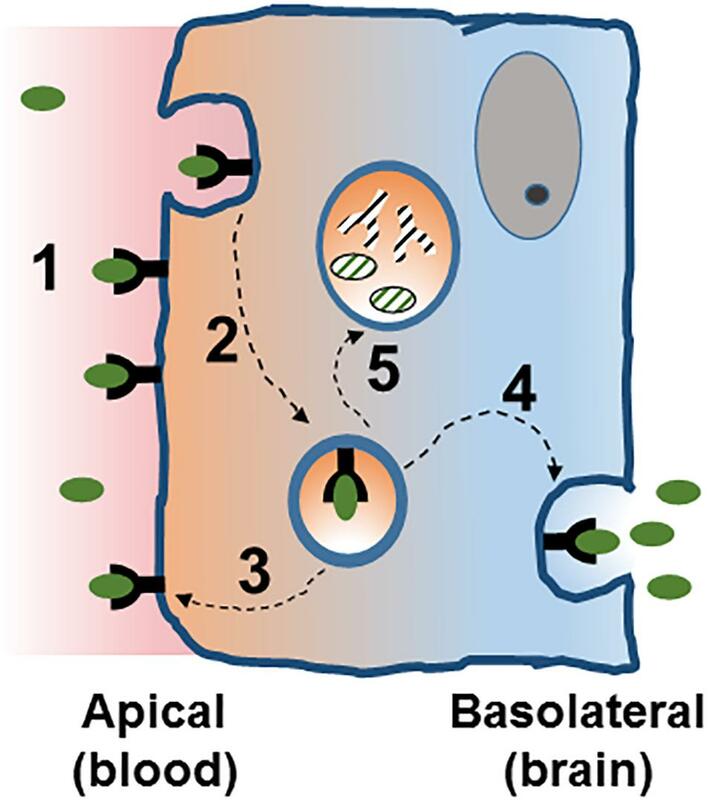 Intracellularly, the vesicle can follow different traffic routes including recycling to the apical membrane (3) or routing to the basolateral membrane where membrane fusion allows for the release of the vesicle content [transcytosis, (4)]. Routing of the vesicle to the lysosome (5) would target it for degradation. See text for details. In general, strategies using RMT for drug delivery to the brain involve the generation of a complex between the drug of interest and a receptor-targeting entity. This entity may be the endogenous receptor ligand, an antibody targeting the receptor or a mimetic peptide ligand. These two components can be chemically linked or the drug can be incorporated in liposomes or nanoparticles decorated with the RMT-targeting ligand (Jones and Shusta, 2007). Among the most studied targets for RMT in brain endothelial cells are the transferrin receptor, low-density lipoprotein (LDL) receptor and insulin receptor, for reviews see (Lajoie and Shusta, 2015; Paterson and Webster, 2016). In the following section, some examples of the use of these systems are presented with focus in recent advances. Iron delivery to the brain is accomplished via binding and intracellular trafficking of the iron binding protein transferrin (Tf). The Tf receptor (TfR) has been the target of numerous in vitro and in vivo studies aiming to deliver drugs to the brain (see Table 1). Approaches used include liposomes decorated with Tf used for delivery of imaging agents and DNA (Sharma et al., 2013) or the use of an iron-mimetic peptide as ligand (Staquicini et al., 2011). Since the presence of high blood levels of Tf requires competition with the endogenous ligand, alternative methods involving anti-TfR antibodies have been developed (Qian et al., 2002). Challenges using anti-TfR to deliver drugs to the brain via RMT include specificity to the brain tissue, potential lysosomal degradation and significant transport into the brain parenchyma. With the use of protein engineering it has been shown that reducing antibody’s affinity for Tf improves release of the antigen-antibody complex in the basolateral side of the BBB endothelial cells (Yu et al., 2011). A correlation has also been suggested between increased antibody’s affinity and lysosomal degradation (Bien-Ly et al., 2014) supporting the idea that lower antibody’s affinity would help avoid intracellular degradation of the complexes being transported. Studies comparing the brain penetration of monovalent versus divalent antibodies indicate lower lysosomal colocalization of the monovalent form (Niewoehner et al., 2014) and better transcytosis (Johnsen et al., 2018). It appears that in addition to antibody’s affinity in physiological conditions, a lower affinity at pH5.5 (lysosomal) also promotes effective transcytosis as suggested by in vitro studies using immortalized human brain endothelial cells (Sade et al., 2014). Table 1. Main receptor systems identified mediating receptor-mediated transcytosis (RMT) cargo delivery through the BBB. The recent successes using TfR in RMT strategies has prompted novel developments aiming to potentiate drug delivery to the brain (Yemisci et al., 2018). Thus, recent reports showed efficient BBB crossing of particles functionalized with anti-TfR antibodies and containing non-permeant drugs of interest for treating brain diseases. Some examples include liposomes containing the MYBE/4C1 antihuman TfR antibody and loaded with the anticancer drug doxorubicin displaying enhanced uptake in human brain endothelial cells (Gregori et al., 2016), and liposomes containing Tf and docetaxel showing greater brain uptake after i.v., injection in rats compared to the drug alone (Sonali et al., 2016). The use of nanoparticles formulated using the Tf system has shown that functionalization with anti-TfR antibodies enhances the delivery of particles carrying relevant drugs such as drugs able to inhibit beta amyloid aggregates (Loureiro et al., 2016). Nanoparticles carrying the chemotherapeutic agent temozolomide have also facilitated enhanced drug uptake by glioblastoma cells (Ramalho et al., 2018). This strategy also exemplifies some of the challenges remaining in the field since gold nanoparticles (AuNPs) coated with the 8D3 anti-TfR antibody injected in mouse are transported through the BBB with low efficiency and most of the particles remain sequestered intracellularly in the endothelial cells (Cabezon et al., 2015). Successful uptake by the BBB but low delivery to the brain parenchyma was also reported with quantum dots (Paris-Robidas et al., 2016). The dual functionalization of particles with peptides targeting the TfR to cross the BBB and additional therapeutic agents opens opportunities to specifically modulate gene expression in brain cells as shown by studies of co-delivery of doxorubicin and RNAi targeting the VEGF (Kuang et al., 2016), or siRNA targeting the EGFR (Wei et al., 2016) to glioma cells. The significant reduction in expression of the pro vascularization factors VEGF and EGFR observed in these two studies supports this use of co-delivery systems. TfR has been used extensively as a model for brain transcytosis, although initial reports came from just one laboratory, later reports supported reproducibility of its use in different settings. Outstanding issues remaining such as brain specificity and low drug uptake will promote further research of this important RMT system. Insulin is transported into the brain by the insulin receptor (IR). Similarly to the TfR, anti-IR antibodies have been developed and used in strategies to drug delivery into the brain (see Table 1). Following the development of humanized anti-IR antibodies (HIRMAb) that showed good internalization and transport to the brain after intravenous administration in monkeys (Boado et al., 2007), fusion proteins were developed to deliver relevant enzymes as therapies for genetic disorders. One of those examples is a fusion protein between the HIRMAb and α-L-idorunidase (IDUA) an enzyme missing in Hurler’s Syndrome, Mucopolysaccharidosis Type I (MSPI), a disorder of brain lysosomal storage (Boado et al., 2008). In pre-clinical studies, HIRMAb-IDUA showed good safety, adequate plasma glucose control, and limited antidrug antibody production (Boado et al., 2009, 2012). Of great interest are recent reports describing clinical studies with HIRMAb-IDUA. In MSPI pediatric and adult patients intravenous infusion of HIRMAb-IDUA describes the first clinical use of RMT to drug delivery into the brain (Pardridge et al., 2018). Although some adverse events reported include reaction at the infusion site, and transient hypoglycemia, the positive neurocognitive and somatic effects observed in pediatric patients (Giugliani et al., 2018) represents a significant advancement on the translational aspects of RMT. Low-density lipoprotein receptor (LDLR), a single transmembrane glycoprotein able to recognize LDL particles and promote their endocytosis, as well as LDLR-related proteins (LRPs), are present in the BBB and mediate transport of lipoproteins and other ligands through RMT (Hussain et al., 1999; Candela et al., 2008; Table 1). Recent in vitro studies showed that LDLR is preferentially located in apical rather than basolateral membranes in brain endothelial cells (Molino et al., 2017) supporting a role for ligand uptake from the circulation. To date no antibodies have been developed targeting the LDLR system, however, LDLR and LRP ligands have been used for drug delivery into the brain. One of those ligands is melanotransferrin, which displays a greater rate of brain transport compared to Tf. In spite of structural homology to Tf, melanotransferrin uses the LDLR and not the TfR to cross the BBB (Demeule et al., 2002). Interestingly, recent reports showed melanotrasferrin delivery and in vivo effectiveness of a fusion protein with an interleukin-1 receptor antagonist in a model of neuropathic pain (Thom et al., 2018). Lipoproteins have also been used to target LDLR for effective brain delivery (Wagner et al., 2012), as described in glioblastoma cells (Nikanjam et al., 2007). Recent developments include functionalization of solid nanoparticles with ApoE, these 160 nm nanoparticles showed efficient clathrin-dependent endocytosis and transcellular transport in human brain endothelial cells (Neves et al., 2017). Other targeting members of the LDLR family include “angiopeps.” For example, Angiopep-2 was identified by studying a series of 19 amino acid peptides with the ability to bind the LPR-1 receptor (Demeule et al., 2008). Angiopep-2 was shown to mediate efficient delivery of a conjugate Angiopep-2-placlitaxel to gliomas (Thomas et al., 2009), and more recently antinociceptive properties were demonstrated for an Angiopep-2-neurotensin fusion protein (Demeule et al., 2014). These studies provide evidence of successful delivery of therapeutically relevant agents to the brain via RMT targeting the LDLR family. Single domain antibodies (sdAbs) are naturally occurring fragments of the antibody’s heavy chain that lack the light chain. Among them, sdAbs from camelids specifically FC5 and FC44 have been studied for brain transcytosis of cargo in animal models and their potential warrants further developments (see Table 1). FC5 and FC44 recognize α(2,3)-sialoglycoprotein expressed in the luminal side of brain endothelial cells and display advantages over other antibodies such as small size, greater specificity and stability, and low immunogenicity (Arbabi-Ghahroudi, 2017). Recent advances using RMT are providing alternatives to overcome the barrier properties of the BBB and develop more efficient drug delivery to the brain. Future developments based the TfR, IR, and LDLR and other RMT systems will offer new opportunities in this growing field. However, in spite of clear therapeutic advances shown in animal studies, outstanding challenges remain for the development of efficient and specific RMT-based drug delivery. Although the mechanisms mediating efficient transcytosis through the brain endothelium are still incompletely understood, details about the specific targeting to brain endothelial cells are being revealed. Similarly, the limited brain specific versus systemic drug uptake may explain the lack of success of some potential therapies in non-human primates models of brain diseases. In addition to increasing knowledge about the factors modulating intracellular trafficking, the generation of fusion proteins with RMT-targeting antibodies as well as functionalization of Nano carriers, an improved understanding of BBB transport, pharmacokinetics, and protein engineering will be needed to potentiate the clinical applicability of RMT. VP was responsible for the design of this review, the literature searches, writing and interpretations presented. Stewart, P. A. (2000). Endothelial vesicles in the blood-brain barrier: are they related to permeability? Cell Mol. Neurobiol. 20, 149–163. Thom, G., Tian, M. M., Hatcher, J. P., Rodrigo, N., Burrell, M., Gurrell, I., et al. (2018). A peptide derived from melanotransferrin delivers a protein-based interleukin 1 receptor antagonist across the BBB and ameliorates neuropathic pain in a preclinical model. J. Cereb. Blood Flow Metab. doi: 10.1177/0271678X18772998 [Epub ahead of print],. Copyright © 2019 Pulgar. This is an open-access article distributed under the terms of the Creative Commons Attribution License (CC BY). The use, distribution or reproduction in other forums is permitted, provided the original author(s) and the copyright owner(s) are credited and that the original publication in this journal is cited, in accordance with accepted academic practice. No use, distribution or reproduction is permitted which does not comply with these terms.